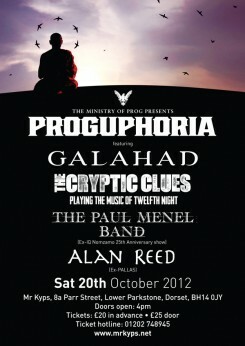 The inaugural festival took place in Poole on Sat 20th October. It went well despite a few technical problems and the evening running very late, which meant that we had to cut short our set quite a bit. Apologies for that – not our fault! Mark Spencer managed to play with 3 of the 4 bands and everyone there seemed to have a great time. We haven’t seen any reviews yet – so let us know if you come across anything.